Yesterday at E3, Skatter Tech was able to go behind scenes at the Harmonix and MTV Games booth and get a closer look at what is possibly the most revolutionary music game title to hit stores this year. The highly anticipated Rock Band 3 looks to completely change the music genre with the addition of the new pro mode, which offers players a more accurate simulation of the music experience and gives the game an overall more true to life “rocking out” vibe. 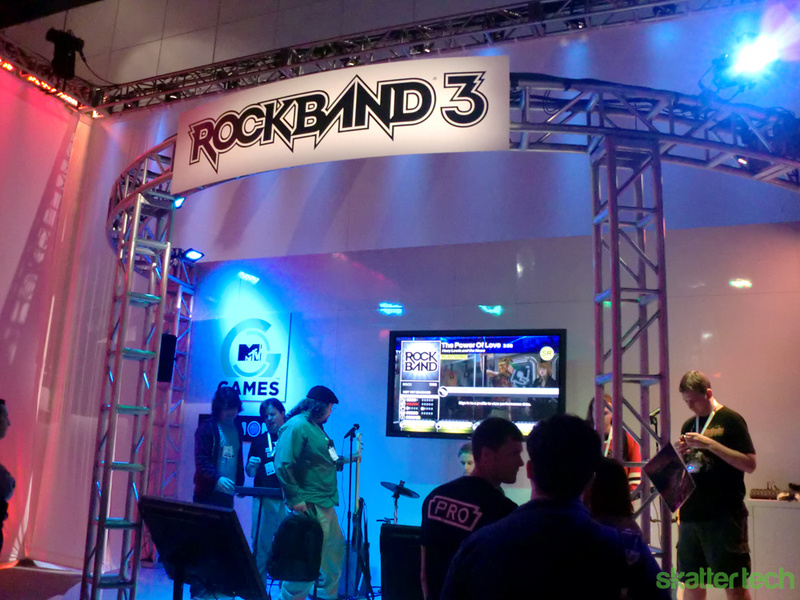 As some readers may remember, Rock Band 3 was the title that I was most excited to see at E3 this year, and I’m pleased to announce that the demo I attended at the Harmonix and MTV Games booth surpassed all of my expectations. Everything about Rock Band 3 was impressive. For starters, the soundtrack is beyond amazing. Players will have 83 new songs to choose from in addition to existing Rock Band tracks as well as access to a music library with nearly 1,500 titles (2,000 by the end of this year). Some of the new songs include “The Hardest Button to Button” by The White Stripes, “Dead End Friends” by Them Crooked Vultures, “Crazy Train” by Ozzy Osbourne, and, one of my personal all time favorites, Queen’s “Bohemian Rhapsody.”Since it would literally take hours to scroll through each of these songs in any order, Rock Band 3 is introducing a new filtering system which will allow players to sort through tracks by genre, song length, decade, difficulty,or even location (e.g. songs from Rock Band 1 or Rock Band 2). This means that players will be able to select only easy rock songs from the 80s under 3 minutes from Rock Band 2 if they so choose. The best part is that all of these new songs will be offered with more depth than ever before: along with the highly publicized new addition of the twenty five key keyboard, Rock Band 3 has included three-part harmonizing vocals. Not only does this mean that songs like “Bohemian Rhapsody” can be played to their full vocal and instrumental potential, but also that now up to seven people can play Rock Band, making it an even better party game. Two quick notes about the keyboard. First, players who do not want to pay the money for the new keyboard instrument can play the keyboard parts on the guitar controllers they already have. Second, both the keyboard and the two new pro mode guitars that will be discussed below are midi controllers, which lets musicians upload and edit their favorite jams. This means that you can plug in the instruments to your computers or midi-amps and use any music editing software you already have to produce your own tune. 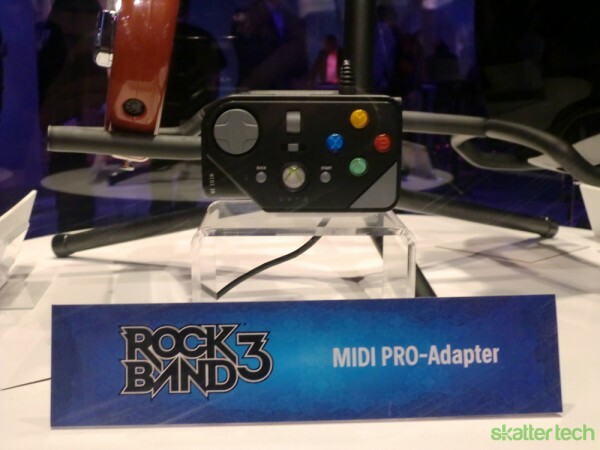 The most exciting addition in Rock Band 3, however, is by far the new pro mode and accompanying instruments. This mode, which ranges in difficulty from Easy to Expert just like the standard play mode, enables players to learn real-world music skills by letting them play more or less true to life simulations of guitar, bass, drums, and keyboard. One common complaint about previous music games is that game play was too abstract; you can’t exactly say that you are playing the guitar or keyboard by pushing a few colored buttons. Pro mode completely changes this by getting players to use all twenty five keys on the keyboard controller and all six strings and frets on guitar. To accomplish this, Mad Catz has created two new pro guitar controllers for Rock Band 3. The first, the Fender Mustang PRO-Guitar, has buttons covering the neck and six strings for strumming. But it is really the second new instrument, the Rock Band 3 Squier guitar controller, that is the most impressive. 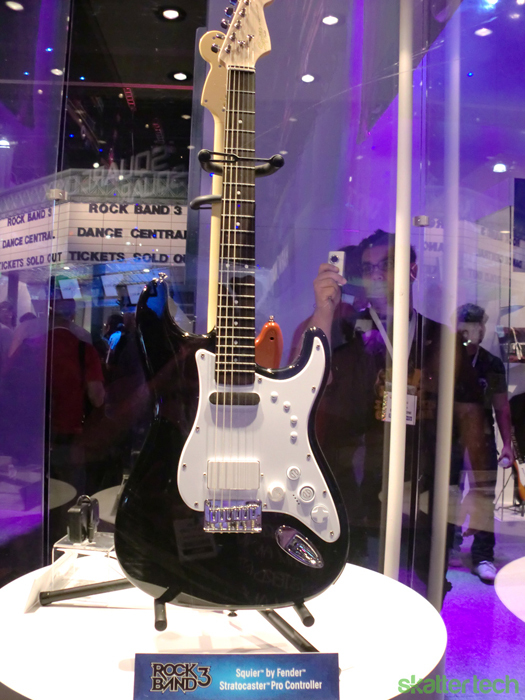 It is an actual real life guitar that can be plugged into an amp and played independently from the game. During gameplay, the Squier uses sensor technology built into the neck to track the player’s fingers while he or she is working through the song. I was initially skeptical about how responsive this technology would be, but I have to admit I was shell shocked during yesterday morning’s demo when the player plugged the Squier into his amp to play along with “The Hardest Button to Button” on expert. Actual guitar music filled the room as his fingers moved up and down the Squier’s neck with the utmost precision, matching the game notes on the screen perfectly. It was as if I were at an actual rock concert, which is exactly what the developers are aiming for. From what I saw at E3 today, the latest Rock Band has managed to meet all of my expectations and then some. The pro mode really does offer a whole new approach to music games and lets players learn skills that they can use to play real instruments. The developers really outdid themselves during the two to three years it took to develop the technology needed to make the Squier possible. I personally can’t wait to get my hands on Rock Band 3 when it comes out during the holidays later this year and get my rock star on!